Make your black dress look like it's from the 1920s with just a few added accessories. The little black dress was actually an invention of Coco Chanel in the 1920s, according to "Biography." Black was once a color only associated for mourning, and she turned it into chic evening wear, which is ideal for your specific needs. Gather your black dress at one of the hips. Pin a large flower brooch to hold the gather. Many 1920s dress had lowered waistlines. If your dress is a simple A-line style, pinning a brooch can give it a 1920s silhouette. Sew fringe in rows all the way down your dress if it is a thin strapped tube dress. Fringe instantly gives the dress a "flapper" look. Expert sewers can experiment with sewing the fringe at an angle for a more sophisticated look. Wear flesh-toned stockings, which were worn during the era. Wear black ballet flats or low heeled shoes to match the 1920s look. Add a long rope necklace of white pearls around your neck. Hang the necklace to just below your chest. Wear a matching pearl or beaded bracelet. Wrap a feather boa around your shoulders or carry a feather fan. Powder your skin a shade lighter than you usually wear. Apply red lipstick and dark eye shadow to the top lid of your eyes. Side part your hair, and use a curling iron to add smooth waves over your ears. Wear hair in a short bob hairstyle, popular in the 1920s, or pull long hair into a chignon, which is a type of hair knot in the back. Dangling earrings can be added to your 1920s look. 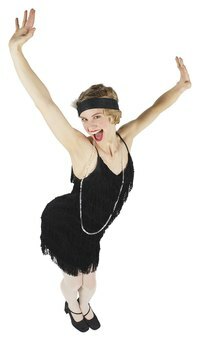 Boyish dresses were worn during the 1920s, so it looked like women had no hips and flat bosoms. A cloche hat can also accessorize a black dress to look 1920s.